FRIDAY, Feb. 17, 2017 (HealthDay News) -- Mold can grow almost anywhere. But limiting moisture can help prevent it from developing indoors and causing health problems, according to the U.S. Environmental Protection Agency. 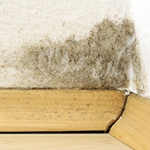 If mold develops it must be removed, because it can cause allergic reactions, asthma and other breathing problems. Use water and detergent to remove mold from surfaces and dry affected areas completely afterwards. If mold develops on absorbent materials, such as ceiling tiles, they may need to be replaced. Provide ventilation to the outside for clothes dryers, bathrooms and other areas that produce moisture. Use air conditioners and de-humidifiers. Use exhaust fans while cooking, washing dishes or cleaning. If building materials or furnishings get wet, clean and dry within 48 hours. Insulate cold surfaces, such as windows, exterior walls, roofs and floors to prevent condensation.